Dating from its construction in 1908, the Great Southern Golf Club is a historic golf course located on the Gulf of Mexico. It is also the location where golf originated in Mississippi; its modernization in 1998, this PGA approved course is perfect for players of every level, offering challenges and a stunningly scenic golf experience. With a setting next to the Gulf of Mexico, views of the sky and sea make for a truly remarkable environment in which to play. The land was once owned by Jefferson Davis, who lived in nearby Biloxi. Originally designed in 1908 by Donald J. Ross, it had 9 holes and was a course on which to play for those who stayed at the Great Southern Hotel. PGA legends, such as Ben Hogan, Sam Sneed and Byron Nelson all played at this Gulfport golf course; additionally, President Woodrow Wilson made the course one his favorites, playing there every day. Daily rates for visitors are reasonable, and annual memberships are available. Ladies Day, Military Day and Senior Day are all days on which priority and discounted rates are given. 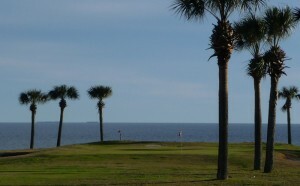 The Great Southern Golf Club is one of the treasures of Gulfport and a beautiful place to enjoy the game in an historic and magnificently scenic setting on the Gulf of Mexico.